Larry J. Sabato's Crystal Ball » Romney Wins Debate, But How Much Does It Matter? Romney Wins Debate, But How Much Does It Matter? It’s pretty obvious who turned in a stronger performance in the first presidential debate last night. And it certainly wasn’t the incumbent. This may have been Mitt Romney’s best debate ever, and it almost certainly was Barack Obama’s worst. The question is, will it matter and, if so, how much will it matter? Romney, who has been persistently trailing by a few points in the national polls and in the key swing states, was more concise, focused and confident than President Obama on Wednesday evening. Obama, given several opportunities to counterattack on some of Romney’s points, appeared unwilling to do so, retreating to bland, small-bore, Clintonian talking points. Among the weapons that the president left on the stage was any reference to Romney’s now infamous “47%” comment. Perhaps the Obama campaign had a strategic reason for not using that line of attack, but whatever the reasoning was, it sure seems like a mistake. Even the president’s strongest allies didn’t bother to defend his exceptionally weak performance. This was not, however, a scintillating debate. Much of the back-and-forth centered on policy disagreements and references (“Dodd-Frank”) that many voters don’t know or, honestly, don’t care about. When debates become a battle of studies versus studies, voters nod off. Perhaps we’re missing something, but it doesn’t seem like, 25 years from now, there will be any moments from this debate included in any reporter’s list of “top five debate moments.” And just because Romney won handily — and the press will report it that way — that does not mean voter preferences will necessarily change all that much. Often, voters can judge one candidate to have won a debate, but not change their ballot choice as a consequence. One plus for Romney coming out of the debate tonight is that it seems Republicans, at least as far as we could tell from Twitter and instant polls, clearly felt that their guy won the debate, while Democrats didn’t seem impressed with their candidate. In an election that might come down to turnout and enthusiasm, we suspect that Republicans will have a little more pep in their step around the water cooler today than their Democratic friends. That may or may not matter in the coming weeks. In reality, we won’t know who really “won” the debate until we see how the debate affects the race, and we won’t know that until we have complete poll data for several post-debate days. History cautions us not to overstate the importance of any debate; if this one really does move the numbers in a significant way for Romney, it will be more exception than rule in the relatively short history of televised American presidential debates. Prior to Wednesday night’s debate, Newt Gingrich called the face-off in Denver “the most important single event in Mitt Romney’s career.” Gingrich was one among a chorus of observers who made similar pronouncements about the candidates’ first clash. But can a debate really be a game-changer? 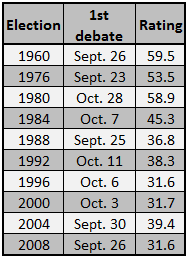 Chart 1 below details Gallup’s polling before and after the first debate in each presidential cycle since 1960. At first glance, it is easy to see that there is always some survey movement before and after a debate, but of course one poll is not a perfect indicator of the political landscape. Plus, these data have a caveat: before 1992, Gallup polled less often, making it harder to judge the polling results in 1960, 1976, 1980, 1984 and 1988 (Gallup polls daily now). But if we look closer at these numbers, there is one trend that seems typical: the race generally tightens after the first debate. This wasn’t really true in 1984 or 2008, but in every election between those years, the gap between the two major party candidates in Gallup narrowed in the days following the candidates’ first clash. The most recent election that is comparable to this one, 2004, saw John Kerry close the gap between himself and incumbent George W. Bush following the first debate. To a certain extent, Kerry’s improvement probably had something to with his debate performance: The conventional wisdom was that Kerry had won, and his victory allowed him to somewhat consolidate the anti-Bush vote. 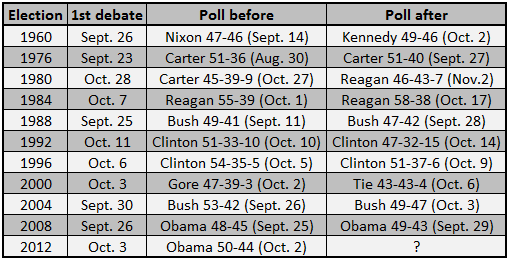 However, Kerry never actually took the lead in the final weeks of that contest, at least according to the RealClearPolitics national average of polls. Romney, after repeating Kerry’s opening debate win (as judged by the press), will hope to recreate the Democrat’s bounce — and then some. There are other observations we can make about before-and-after polling. Our nation’s first televised debate, on Sept. 26, 1960, has long been viewed as a seminal event in American political history, and the story goes that John F. Kennedy got a boost out of the debate and went on to win in November as a result. Considering the less consistent polling of that era, we can’t know that for sure, but Gallup’s numbers do seem to suggest that Kennedy went from being tied with Richard Nixon, more or less, to having a small lead in the aftermath of the debate. The race ended as nearly a national tie — Kennedy won the popular vote by less than 0.2 percentage points, though he captured more than 300 electoral votes (see Rhodes Cook’s story in this week’s Crystal Ball about how close that election truly was). One year where the first debate appears at first blush to have made a big difference was 1980, which featured two classic debate moments: Ronald Reagan’s famous line against Jimmy Carter — “There you go again” — and Reagan’s defining question for the American people: “Are you better off than you were four years ago?” The debate is sometimes seen as pivotal in catapulting Reagan ahead of Jimmy Carter in the closing days of that election (it was the only debate that cycle). But considering the circumstances in the 1980 election (-7.9% GDP growth in the second quarter, the Iran Hostage Crisis negotiations falling apart right before Election Day, stagflation, etc. ), there was clearly more than a debate working against Carter. Did the debate help Reagan? Probably. But did it single-handedly elect him? Certainly not. Even without a good debate performance, Reagan had so much going for him that year that he likely would have won. In the new book The Timeline of Presidential Elections, political scientists Robert S. Erikson and Christopher Wlezien review voter intentions before and after the debates. For the most part, their data indicate that debates don’t have a dramatic effect on voters’ choices and that conventions are more important than debates in determining the course of elections. They also note that it is unclear whether debates are more impactful than other events in the final stretch of the campaign season. It’s also important not to overstate the importance of the debates in the eyes of actual voters. Quinnipiac’s Oct. 2 poll found that a whopping 93% of likely voters intended to watch the debates, which seems to suggest that voters do think the debates are very important. But at the same time, 86% of those likely voters said that they didn’t expect the candidates to say anything that would change their mind; similarly, a recent Wall Street Journal/NBC poll showed that 62% of voters said that the debates are “not important” or “just somewhat important,” compared to 22% saying the clashes will be “quite important” or “extremely important” in determining which candidate they supported. Given the polarized electorate — which Crystal Ball Senior Columnist Alan Abramowitz has written about at length — we believe poll respondents when they say that the debates probably won’t change their minds. But we don’t believe polls that indicate that the vast majority of likely voters watch the debates. A recent Princeton study by Prof. Markus Prior noted that self-reported debate audiences are about twice as large as Nielsen estimates, meaning that many people who say they watch the debates actually don’t. Our suspicion is that many voters know they should watch the debates even though they don’t — so they cover for themselves by equating news reports they see about the debates with actually “watching” them. Notes: Ratings indicate the percentage of households that watched the debate. Put another way, 52.4 million people watched the first debate between John McCain and Barack Obama in 2008. About 130 million voted. Therefore, our guess is that well under half of 2012’s actual voters watched Wednesday night’s debate, no matter what the pre- or post-debate surveys say. If anything, the first 2012 debate provides a good case study about how important debates actually are. If Romney cannot significantly move the polls after turning in such a strong performance against Obama, what is left on the calendar to change the numbers in his favor? (Maybe the two jobs reports or an unscheduled October/November surprise?) Meanwhile, if Romney does make significant gains — cutting into or even erasing the president’s national lead and gaining ground in the swing states, particularly in vital Ohio — will Obama be able to recapture momentum in the debates to come? At least we now have a reason to stay tuned. One thing is for sure: If Democrats were becoming overconfident, thinking that the election was in the bag, this debate should get them refocused. And it should also calm all those anonymous Republicans quoted in news stories complaining about the Romney campaign. Of course, it’s the poll numbers that matter. We’ll see where they are next week, and we will adjust our perceptions of this contest accordingly.